Hi friends! We have sparkling summer weather here today, which is lovely. 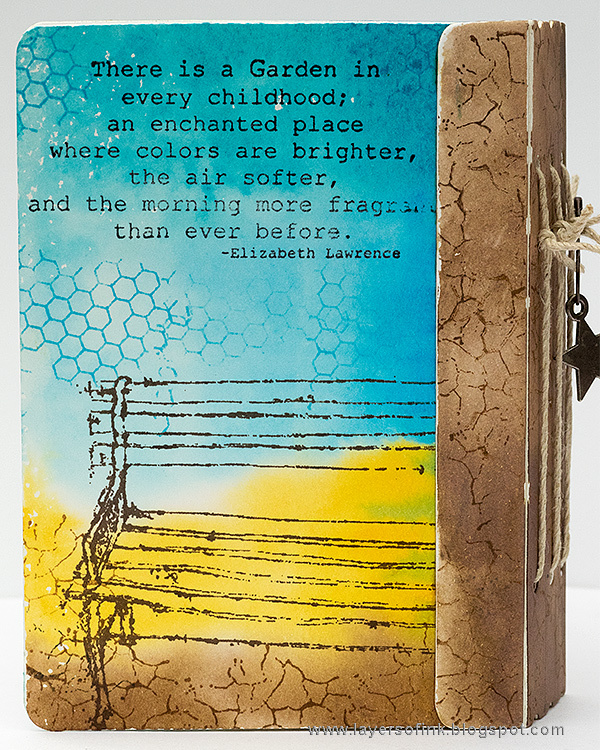 This month the Eileen Hull Inspiration Team has teamed up with Stampotique Originals. I hadn't used their stamps before, and really enjoyed them. There are so many stamps to choose from and they are designed by many different artists. 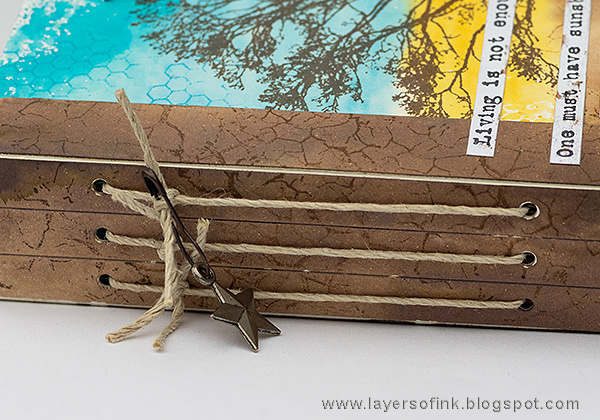 Since I wanted to do lots of stamping, I decided to do a mini-book, using Eileen's Sizzix Passport Book die. The quote on the front is a favorite of mine and I was happy to find it as a stamp. 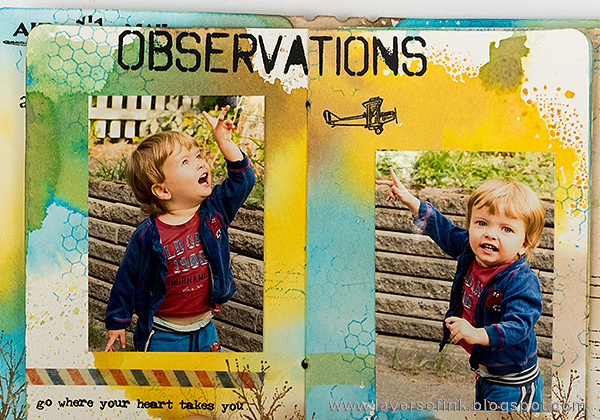 This little book is about airplane watching, which is one of Leo's favorite activities. Since we live quite close to the airport, we get lots of airplanes flying past and ever since he was very little Leo has loved to look at them whenever we are outdoors playing or walking. 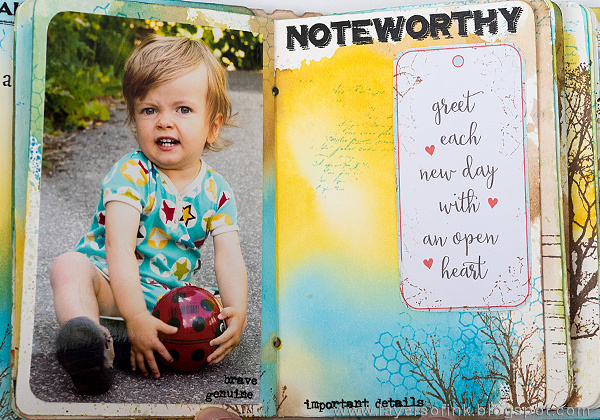 Start by die cutting the pieces needed for the cover from mat board using the Passport Book die and Extended Cutting Pads. I die cut the covers twice more from watercolor paper, but you could also work directly on the mat board, since it takes ink beautifully. 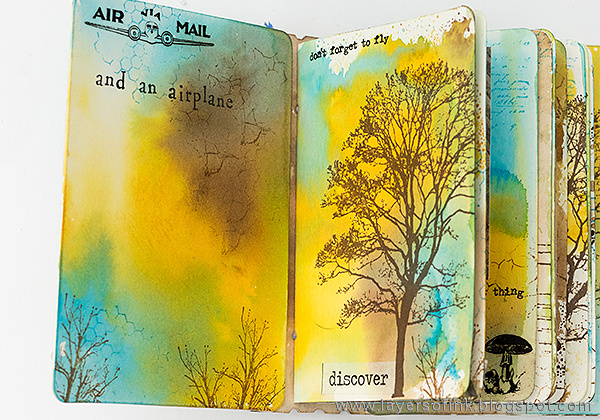 Die cut pages from watercolor paper using the same Passport Book die. 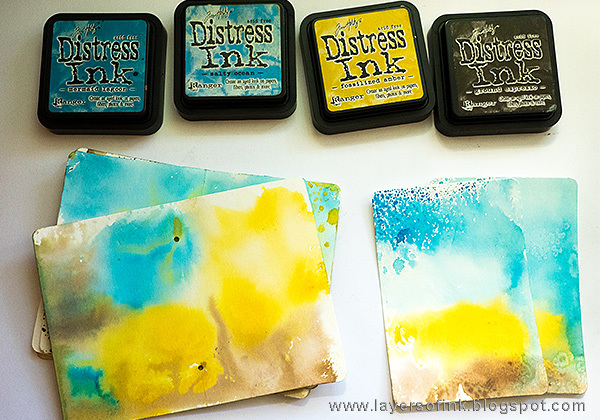 Smear Distress Ink on an acrylic block, mist with water and press the block on the papers. Repeat on both sides. 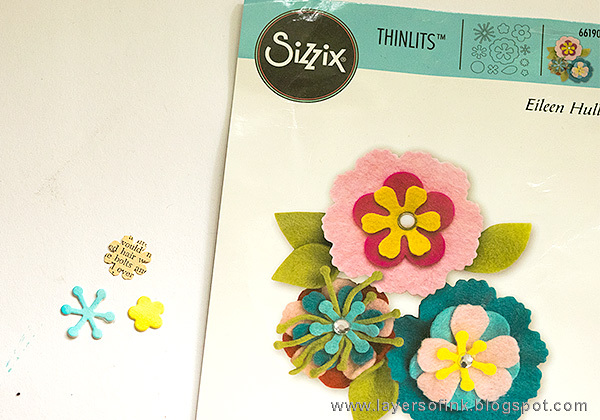 If you don't have a large enough acrylic block, you can also use a Sizzix Cutting Pad. It works best with an unused pad which is smooth. When dry, stamp the covers and spine. 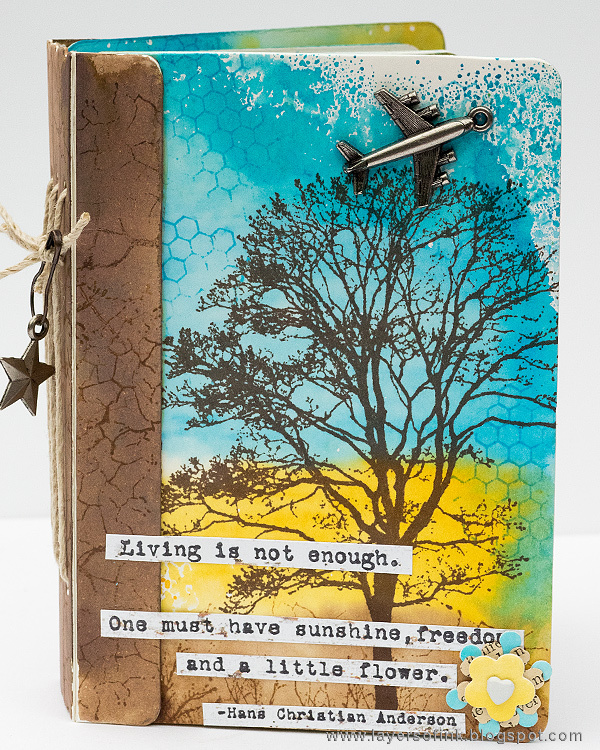 I used the following stamps from Stampotique: Majestic Tree, Vintage Bill and Design Cube 2 by France Papillon, Sit Down by Karen Hayseldon and Living is Not Enough and There is a Garden by Carol's Collection. 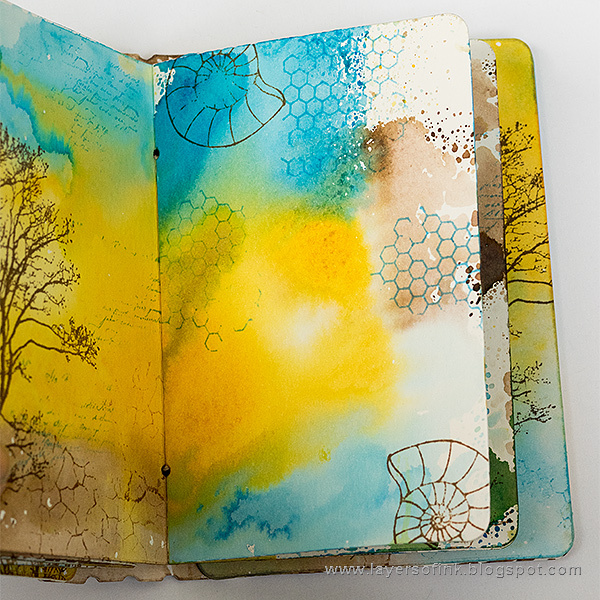 They were stamped with Archival Inks from Tim's and Dina's Mixed Media Palettes. Do the same to all the inside pages. I love to sit and just stamp along like this. 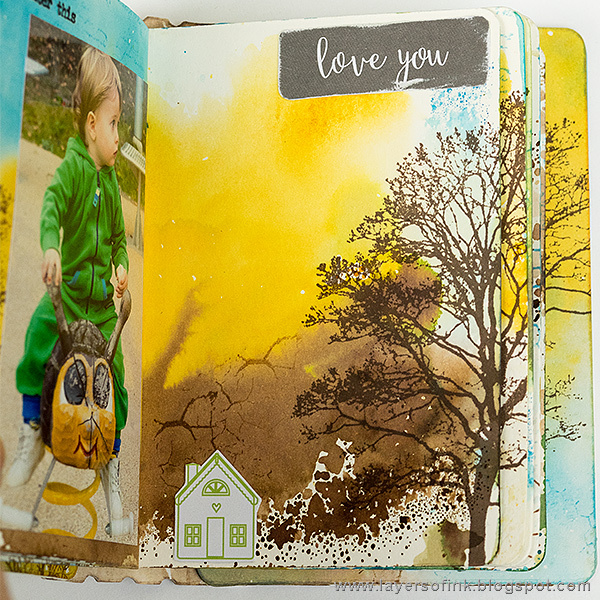 Remember that you don't always have to stamp the whole tree or the whole bench. 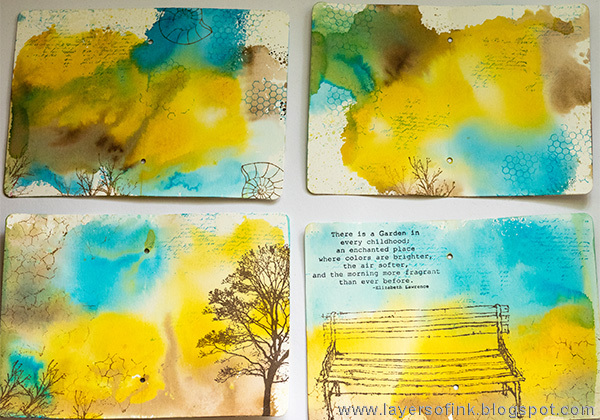 I stamped the four stamps from the Design Cube 2 and the Vintage Bill here an there in the backgrounds. For the little flower, I used Eileen's Stitchy Flowers and Leaf from the Heartfelt collection. Die cut from left-over inky paper, and from book paper. 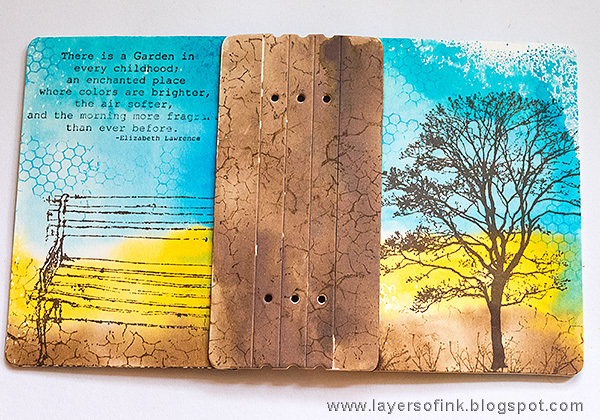 The sentiment was stamped on wood grain paper and cut into strips. 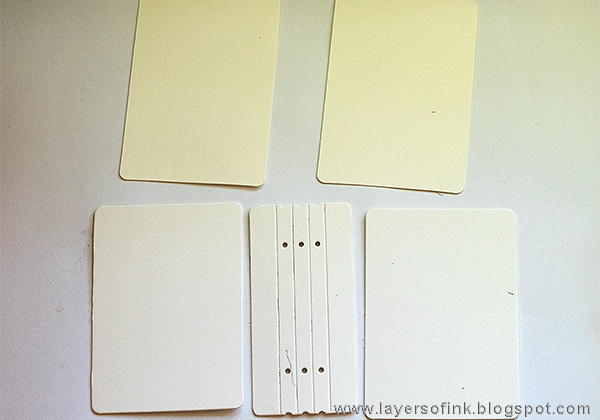 Glue the spine to the covers or use a strong tape, such as Wonder Tape. I used Matte Medium. Here you can see what the ink looks like straight onto the mat board - you can hardly see a difference compared to the watercolour paper. Mat board works really great with wet media. 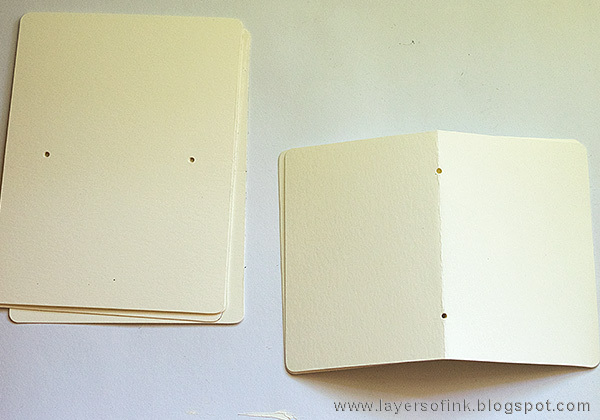 Fold the pages into signatures of two or three spreads and thread twine through the holes. Tie the twine at the spine. I also added a Tim Holtz star. 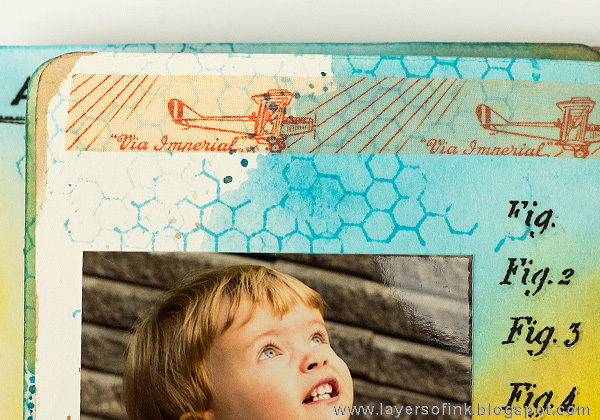 The airplane was glued to the cover with Matte Medium. 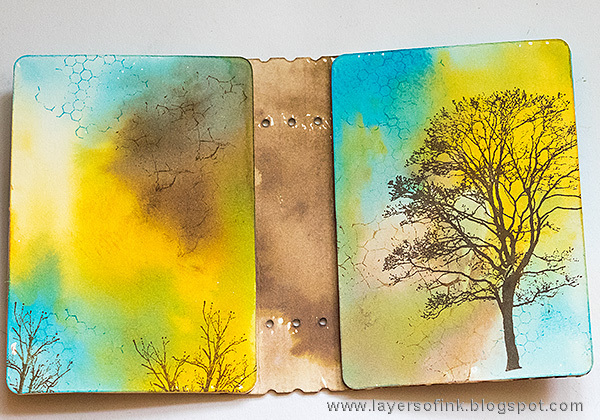 I really love the look of this tree stamp. It has lovely details and is very versatile. Here's the book from the back. 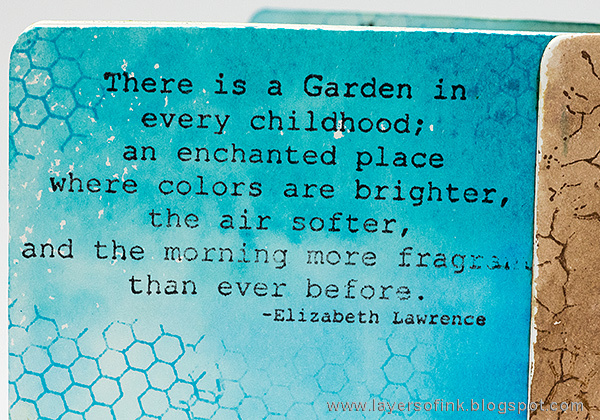 I like this quote and it is so true, and the garden doesn't necessarily have to be a garden at a house, but can stretch further into places often visited. I imagine there will be airplanes flying by in Leo's memories of his own enchanted garden. 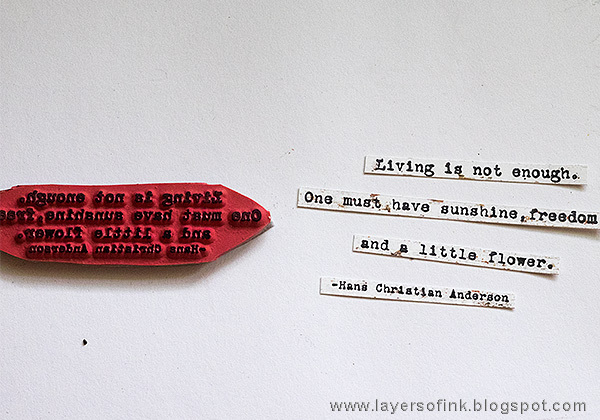 The H.C. Andersen quote on the front of the book, is followed on the inside with 'and an airplane', to fit with the theme of the book. I have many photos of Leo pointing to airplanes like these ones. He is still as excited every time an airplane flies by and in the afternoons he wants to go outdoors to look at airplanes. It was also one of his first words. 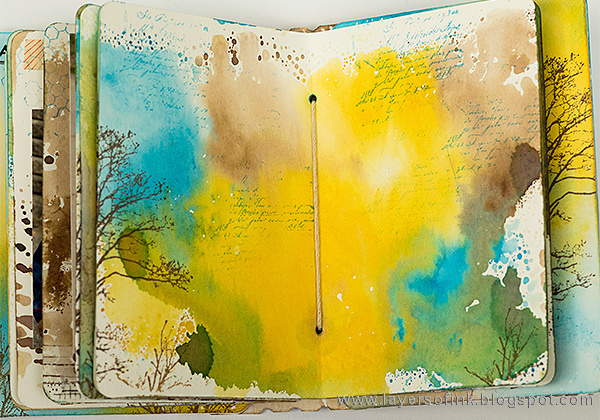 I wrote the journaling on a couple of pages in the beginning of the book. 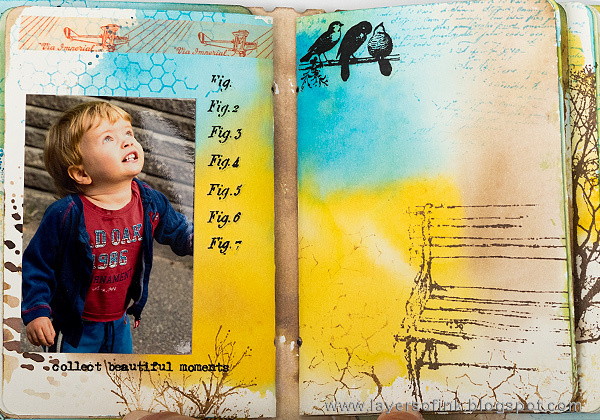 I embellished the book simply, using just some Tim Holtz rub-ons, design tape and some words from Eileen's Heartfelt paper pad. I might later find a photo where Leo sits on a bench or a chair and cut him out and adhere it on the bench. 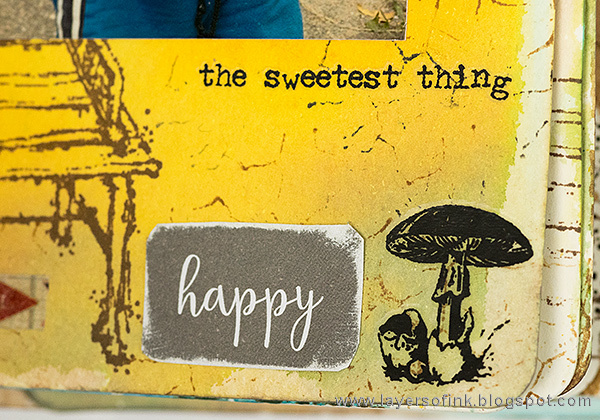 Another sentiment from Eileen's paper pad, stamped with the crackle stamp. I still need to add more journaling. 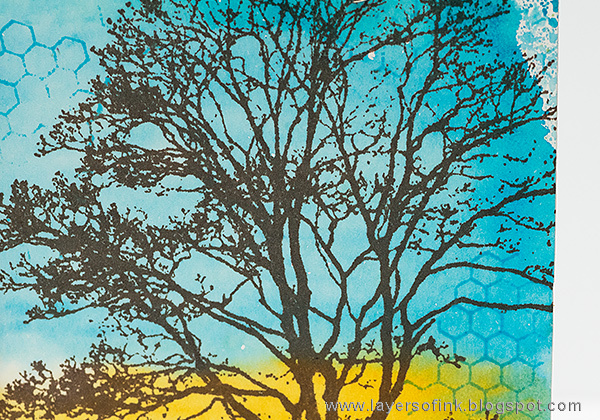 The colors on this bee inspired the color combo in the book, with the addition of blue. The little house was cut from the Heartfelt paper pad, and so was the word. 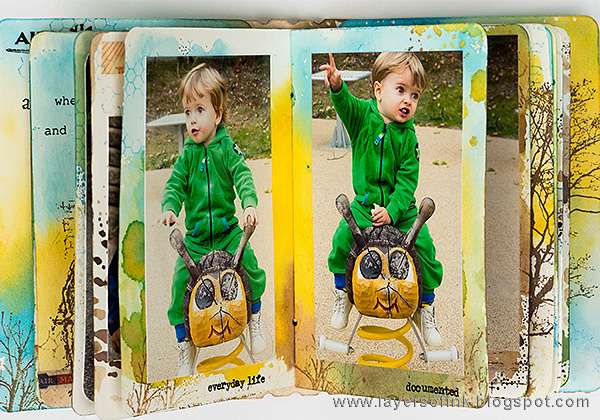 I left the last pages blank because I have quite many newer photos where Leo also points to airplanes and I will add them here as soon as I have had them printed (I don't print photos at home). This inking technique is very quick, but gives a different look to each page, at the same time as it creates a sense of unity throughout the book. 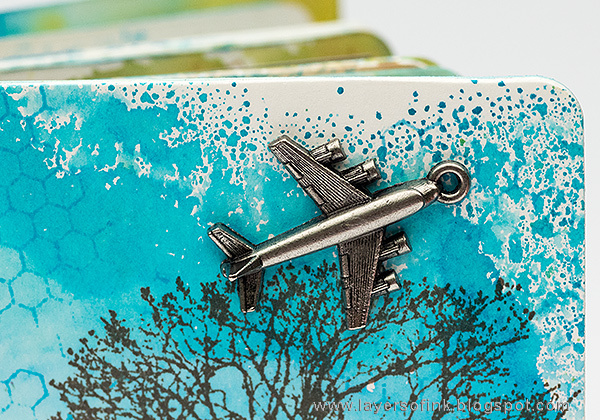 The Passport Book die makes a very chunky little book, which I really like and it is so easy to use. 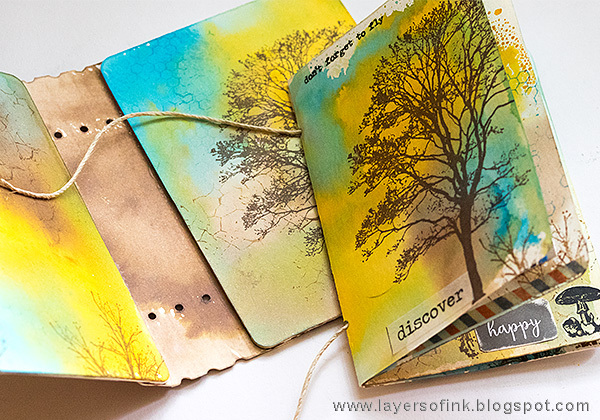 To see other examples of this die, check out my Crackle Album and Halloween Stamped Book. Don't miss all the inspiration posted during this month. 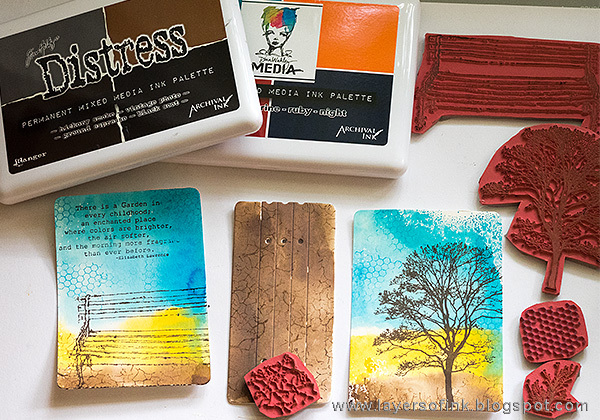 Stamps: Stampotique: Majestic Tree, Sit Down, Design Cube 2, Vintage Bill, Living is Not Enough, There is a Garden. WOW!!! What a spectacular book! Love this book. Great idea to create a mini with such a simple concept. Nice to see the finished pages with such detail. Thanks for the tutorial!! 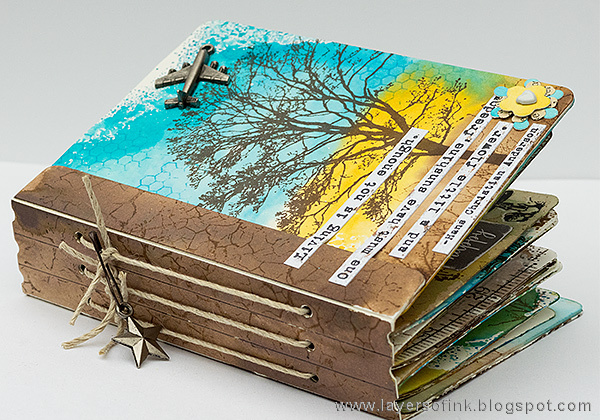 I've been coveting that tree stamp for a long time - stunning cover, and such treats on every page. The whole thing just makes me happy. Stunning color palette on this amazing album! 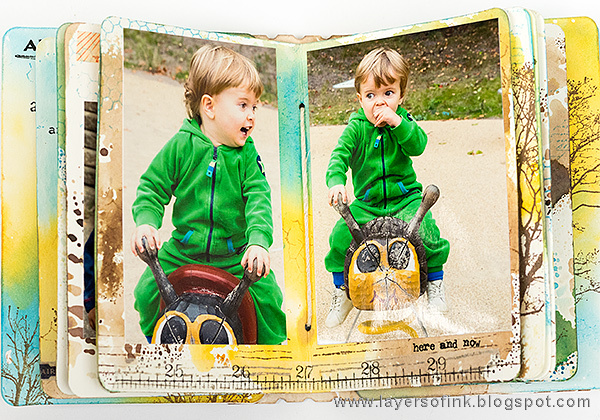 Your photos of your son are so sweet, and you have given them pride of place with this gorgeous album! 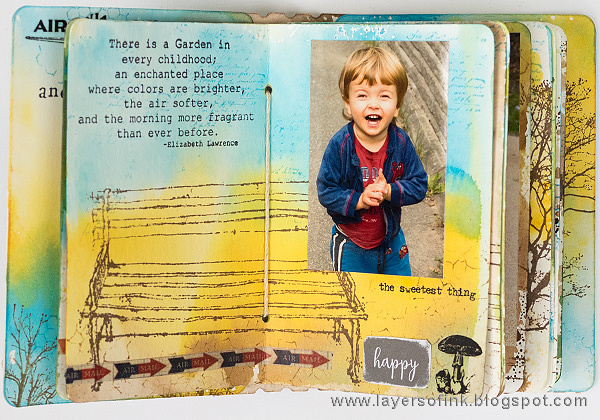 What a precious book to hold all the photos of Little Leo who is not that little anymore. What a sweetheart! Beautiful!